It is not a valid question. It is not the case that there is a pre-existing “I”, to which we can assign some qualities such as stupidity. Instead, I am the sum of all my qualities, including the quality of being stupid. you can change the figure itself, replacing it with a rectangle. To improve yourself, you have to delete some of your drawbacks. To delete your drawbacks, you have to delete parts of yourself, replacing them with good ones. It is difficult to change oneself because it is not just to change some qualities of oneself, but also to change of the definition or identity of oneself. You have to give up part of your original self in order to become a better self. 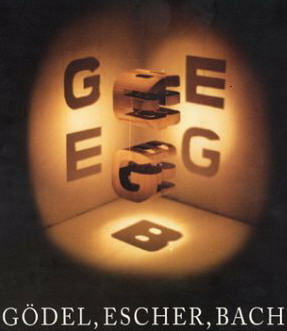 Douglas Hofstadter’s Godel, Escher, Bach uses self-referencing mathematical (formal language) and English (natural language) sentences, pictures (M.C. Escher’s dragon for example), and music (Bach’s fugues) to convey the concept and its recursive nature. In response to confusion over the book’s theme, Hofstadter has emphasized that GEB is not about mathematics, art, and music but rather about how cognition and thinking emerge from well-hidden neurological mechanisms. In the book, he presents an analogy about how the individual neurons of the brain coordinate to create a unified sense of a coherent mind by comparing it to the social organization displayed in a colony of ants. — What Kind of Buddhist was Steve Jobs, Really?